Hey there! “Is Dinnertime a Downer?” is available on audio — just click below to listen. We barely recognize you anymore. Because rare are the evenings where we slow down and sit down, when we enjoy a savory meal made with care, time, and from scratch. Sure, those meals happen now and again, but most nights, dinner means getting takeout on the way home from soccer or lacrosse. Or pulling something out the freezer and blasting it in the microwave. Or, on those nights after really long days: cereal. Toast. Yogurt. Popcorn. It’s not so bad, we tell ourselves, it’s fortified, right? I’ll do better tomorrow. But then one cereal or takeout night leads to another, and we find ourselves in a rut. And then, we start getting bummed out. Because our bodies don’t feel good. They’re burdened with extra weight. We wake up exhausted. Our skin looks dull. Our cholesterol’s up. And part of us, the part that’s especially tired and frustrated, might start to blame all of this on dinner. And lunch is easy. On good days we grab a salad. Or, we skip it, and then graze and snack our way to dinner. But then dinnertime looms near, and we start to panic. After all, we’ve been mailing it in all day, and dinner represents our last chance for redemption. If we can just have a healthy dinner, we lament, our dietary shortcomings of the day will be erased. We will have taken care of our families, our bodies, our wellbeing — if only we could put a healthy dinner on the table. It’s nearing five, and we’re too tired to go to the store. Plus, there’s nothing good in our pantry. We’re starving, because we’ve deprived ourselves all day. Why do you have to be so difficult? Why do you have to take so much time? Why can’t you be easy and convenient? And then, we might even start to think: I hate dinner. Poor dinner. So misunderstood, so undervalued. Plus, maybe a bit outdated. At least, in terms of how we think of it now. But that’s all about to change. I’m here to coach you through all of this dinner drama. For a lot of people, inadequate meal planning and prep is the root cause of dinner drama. But once you get into your kitchen prep flow, you’ll be enjoying nutritious satisfying meals all throughout the week. With a simple, step-by-step plan I use with all of my healthy lifestyle clients. First, I think it’s helpful to understand why dinnertime has become a downer for so many people. It’s pretty much an inevitable outcome considering the conditions of our modern-day lifestyle and culture. There are so many reasons, in fact, that I’m not sure where to start. So I’ll just focus on the big ones in today’s post. I could, of course, skip over all of this, but it’s important if you really want to nail this dinner thing, once and for all. It’s often said that you can’t change what you’re not aware of — and this is true of dinner drama as much as anything. If you’re feeling stressed, or sleep-deprived, or frazzled, I want you to understand how changing your lifestyle habits can help support your desire to get healthier meals on the table. 1. Team No Sleep — According to the Centers for Disease Control, 1 in 3 Americans only get about 6 hours of sleep a night, making them chronically sleep deprived (the CDC recommends 7+ hours a night). And the average isn’t much better — Americans currently average 6.8 hours of sleep at night, down more than an hour from 1942. When so many of us are operating on less than adequate sleep, it’s easy to see why our last meal of the day suffers. After all, it comes long after our morning coffee’s worn off, and after we’ve either worked or had a busy day raising kiddos, and after we’ve commuted and shuttled and carpooled all over town. It’s no wonder that dinnertime rolls around and we don’t want to go to the store — or heaven forbid — cook. We’re just too damn tired! 2. Lack of Time — Adults employed full-time report working an average of 47 hours per week, which equates to nearly six days a week, according to Gallup. That’s about an hour and a half more than they reported a decade ago. And even though statistics indicate that we, in general, have more leisure time than we did 40 years ago, it appears that we’ve filled up our leisure hours with overscheduling, social media, binge-watching, and other activities that contribute to a chronic state of “busy-ness.” In other words, we’re so busy doing other things (Netflix, Facebook) that we’re too busy… to cook. 3. Never Unplugged — In a story reported on CNN, teens spend an average of 9 hours a day online — more time than they spend sleeping, or with their families or teachers. In addition, a Pew Research Center report discovered that some 21% of Americans now report that they go online “almost constantly.” When we’re always plugged in, our brains and bodies don’t get the healing, restorative benefits that can come from being outdoors, meditation, mindfulness, and… you guessed it, sleep! This constant sensation of being plugged in — processing data, tracking information, over-stimulating the brain — can contribute to feelings of overwhelm and stress. And when you’re overwhelmed and stressed, guess what you don’t feel like doing? You’ve got it: cooking! Get 7+ hours of sleep per night. Cut back on social media, Netflix-bingeing and other non-essentials until you get some healthy meal prep under your belt. Unplug for at least one hour before bedtime every night. Try reading a book, taking a hot bath, journaling, or doing some light stretching or yoga exercises. Okay? I mean it. All of this is so important. As stressful and busy as life — and dinnertime — can be, however, I know you still have hope. You’re looking for solutions. You aspire for more than those burritos or bake-at-home pizzas that leave you feeling bloated and bummed out later. In fact, you love and appreciate good food — like when you go out to dinner at a nice restaurant. You probably also enjoy beautiful salads, roasted vegetables, curries, savory soups, cold-pressed juices, and juice bar smoothies made with exotic ingredients. You love all of this healthy, beautiful food so much that in the morning, you think, “I’m going to make a great dinner tonight.” Maybe a recipe online caught your eye, or a cooking video a friend posted on Facebook, or something from your Pinterest board for healthy recipes. But then you have a DAY. The end of the day comes and even the mere thought of getting takeout sounds too exhausting. Tomorrow, you say. I’ll cook tomorrow. But then the cycle repeats itself and you’re firmly entrenched in takeout or cereal-for-dinner mode. So here’s what I propose — it takes a little advance planning and some weekend time in the kitchen. But only an hour. Or two, tops. And since we all get 168 hours in a week, I can assure you that saving just 1 or 2 of those precious hours for this noble deed will pay great rewards. So what is this miracle proposal, this silver bullet? I call it the Leftovers Lifestyle. Confession: I’m not a big fan of cooking from-scratch every night. I don’t have the time and energy for it, and I don’t think you do either. That’s why I encourage clients to embrace the Leftovers Lifestyle. The Leftovers Lifestyle means that a from-scratch meal is waiting for you when you get home after a long day. The Leftovers Lifestyle means that you can take care of your body, your family, and your conscience all in one healthy meal that can be on the table within 15 minutes of walking in the front door. The Leftovers Lifestyle means that you can eat healthy food without hassle. The Leftovers Lifestyle has a catch, however: it’s only possible when you make a serious commitment to weekend prep and batch cooking. It doesn’t require a long commitment on the weekend, but you must be consistent. It has to happen every weekend, or your week will be shot. You’ll be back in cereal-land, and that’s nowhere for people with big dreams — like you — to hang out. Setting aside some quality time at the store and in the kitchen on the weekend is vital. It doesn’t have to take a big chunk out of your weekend, but it does need to be a priority. All I’m asking for here is some shopping time on Saturday — which you probably already do — and some prep time on Sunday. We’re talking about 2 hours over the weekend, tops. If two hours sounds like a lot, consider this: a bit of prep work on the weekend will save you massive time during the week, not to mention the hassle of hunting down takeout, or the heartache of feeling like a kitchen failure on those takeout nights. On Thursday evening or Friday afternoon, make a meal plan for the week ahead. Determine which nights you’ll cook, and which nights will be assigned to leftovers or takeout. Be realistic. If you only have time to cook 1 or 2 weeknight meals, make that your goal. And don’t beat yourself up about the rest. Remember: small wins win the game. You have time to boost your home-cooking percentage later on. Also on Friday, make a shopping list based on your meal plan. On Saturday, go grocery shopping with your list. Try to avoid meal planning while actually shopping. That results in buying too much food, and then watching it go to waste later in the week. Rinse and prep salad and leafy greens. Store in plastic bags with a paper towel to absorb extra moisture. Rinse and chop veggies for quick soups, sautés, curries, and stir-fries. Shoot for 3 containers of chopped veggies, such as zucchini, red pepper strips, and onion. Make a salad dressing for the week. Or keep a bottle of aged balsamic vinegar and extra virgin olive oil on hand to drizzle over salad greens. Make a big batch of soup. This can come in handy for 2-3 meals throughout the week. For example, enjoy it on Sunday night, then again for lunch on Monday, then again for Tuesday night dinner. Make a big batch of rice or quinoa. Throughout the week, you can use the grains as a base for a quick bowl, using sautéed veggies, steamed greens, beans, hot sauce or soy sauce, or an animal protein of your choice (i.e. shredded rotisserie chicken). After you’re done with your kitchen prep session, you have a fridge full of leftovers — plus freshly prepped or cooked foods you can incorporate into quick stir-fries, scrambles, and soups throughout the week. When you run out of food — say, on Tuesday or Wednesday — simply make another batch of soup or chili to last the next couple of days. Serve with steamed greens or salad. Boom! You’re well on your way to making peace with your old friend Dinner. I hope this coaching session on reducing dinner drama has been helpful. 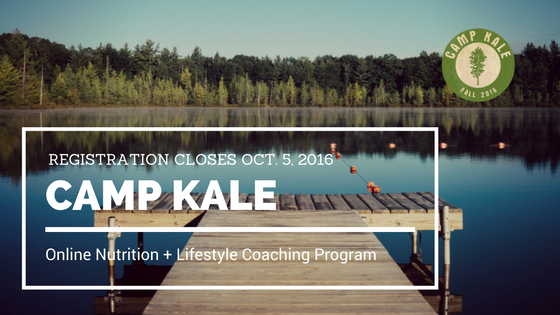 If you’re looking for additional coaching, recipes, meal plans and more, sign up now for Camp Kale. 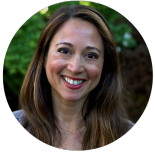 Registration for this online coaching program closes 9pm Pacific on Wednesday, October 5. For details, just click here or on the graphic below.